Sundowners are quite the thing here. There’s something about a beautiful sunset and living by the ocean that makes everything calm. That sits quite well with the great Aussie tradition of consuming alcoholic beverages. Not being a fan of beer, I’m always on the lookout for easy to make drinks for the girls when they come around for drinks. We are very fortunate to live somewhere that has a beautiful view of the city and the ocean. It’s pretty much always perfect gin drinking weather, and this gin rickshaw is such an elegant cocktail that’s fresh but punchy enough for even the guys to get into. I think that calls for some summery drinks, no? I didn’t believe that such a simple recipe could be so delicious. It’s light, refreshing yet complex – I could definitely imagine this becoming our sundowner staple. I’ve tweaked it a little, adding soda water to make it lighter and slightly fizzy, but if you were looking for something a bit bolder and gin-forward, stick with the original. I’ve used it as a light pre-drink, it goes down dangerously easily. To make the basil syrup, bring the sugar and water to the boil over medium heat. Once all the sugar has dissolved, turn off the heat and add the basil. Allow the basil to infuse for about 15 minutes. To get a more full flavoured syrup and blitz it briefly in a blender and strain, pressing out to get the tiny basil bits that give this syrup it's bright green colour. 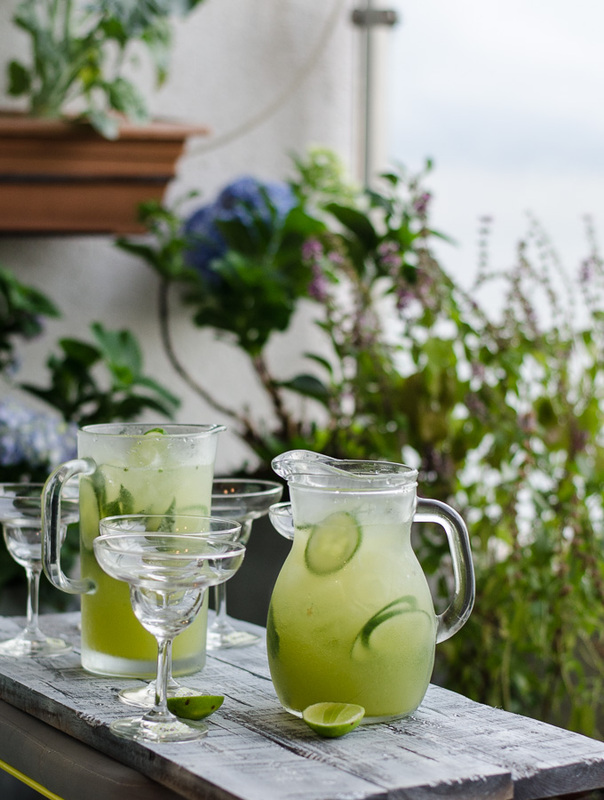 To make the gin rickshaw, fill a pitcher with ice, interspersing with cucumber and basil leaves. Add gin, basil syrup, lime juice (I used 180:90:90ml), stir through then top with soda water.